The modern kitchen is not just a place for cooking and eating, but where we end up spending most of our time as a family – entertaining, doing homework or even just chilling out with a coffee on a Sunday morning. Because of this, our kitchens don’t just have to be highly functional, with plenty of storage space and room for appliances, but must also be beautiful spaces that are a pleasure to be in. That is why creating the perfect room is all the more important and investing some time researching the latest kitchen design ideas will be time well spent. So, with the help of the kitchen design experts at Optiplan Kitchens, we have done some of the legwork for you and put together this list of ten great kitchen design ideas you will almost certainly want to copy. From savvy storage ideas to tech must-haves we show you the looks and features that will make sure your kitchen is incredibly practical and enviably stylish. Before the advent of the domestic fridge, most kitchens would have had a larder for keeping food cool. They were usually well-ventilated to the outside to reduce temperatures so when the fridge-freezer became widely available, people knocked through to increase kitchen space or converted these chilly side-rooms into utility areas. But they are back and the modern pantry is now a part of every high-end fitted kitchen. A pantry has large cupboards with added internal drawers, racks and shelves to store everything you need. Designed to blend seamlessly with the rest of the design, you can create a handy coffee station within, or just use them to make sure you can see all of your spices, sauces and tinned foods which often get lost at the back of deep cupboards. Another place to conceal additional storage is within the drawers themselves. Large deep units, fitted with shallow internal drawers for cutlery make a better use of space and can be more visually pleasing on the outside than lots of different sizes of drawer and door. What’s more, subdividing drawers means you have designated spaces for everything from cooking utensils to rolls of tin foil and even those pesky lids from plastic containers. Anyone who hosts regular soirées – or just appreciates a cool glass of Soave on a Friday night – will know that a well stocked wine fridge trumps battling for bottle space in a fridge full of food. While many modern fridges have wine bottle holders, the optimum temperature for storing wine is different to food so wine fridges have been designed to keep your drinks chilled to perfection. Some even have multiple temperature zones for different wines. In terms of placement, it makes sense to put your wine fridge near where you sit or entertain. This is why they are often added to kitchen islands, or outward facing into living spaces. For a modern, fuss-free look choose handle-less cupboards. These tend to have a push-open operation and being simple and flat, are really easy to clean. Going for this style allows you to be a bit more creative with your colour and material choices elsewhere. The understated cupboards act as the perfect backdrop for exploring feature fixtures like lighting, wow-factor splashbacks or statement seating. Nobody likes crawling to the back of a corner cupboard, but it is a problem as old as the fitted kitchen itself. It needn’t be the case – upgrade your storage to make the most of dead space in corner cupboards with specially designed corner storage features. Swing out drawers will mean you can see – and reach – the entire contents of your cupboard at once. Make the most of every last inch of your kitchen with full-height cabinetry. 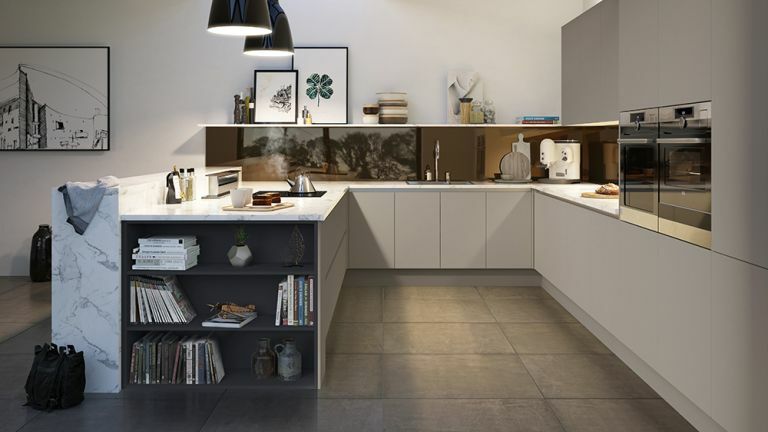 Not only do these not have a top to collect dust, but they take advantage of underutilised vertical space and are great in a minimalist kitchen. Just remember to store things you need less frequently (barbecue utensils, Christmas dinnerware and other seasonal items) at the top. A timeless kitchen is the best investment and no style has stood the test of time like a classic Shaker design. They are utilitarian with limited detailing, but elegant, too – and look right at home in a country-style kitchen. For an up-to-date take on the look choose a painted design which can easily be updated in the future, should you wish. Don’t be afraid to choose more than one colour to pick out different zones of the kitchen and add interest – as shown in this Dorchester kitchen from Optiplan Kitchens, finished in Gunpowder and Light Grey. Lots of beautiful crockery hiding in your cupboards? Show it off with well-styled open shelving. This is not one for fans of minimalism, but is a great way to use practical items – like your pans and glassware – to create a design feature. Choose cupboards with glass doors to keep grease and dust at bay and be selective about presentation. We are seeing more and more use of mixed materials in kitchens as people not only like the variety of colours this brings, but also the range of textures. ‘Combining different styles of countertops in contrasting colours and textures helps to create visual drama and creativity within the room. It’s also a great option for those on a budget as a stunning piece of marble can be used in a small area as a focal point, whilst a cost-effect surface can be utilised for the remaining space.’ Andy Briggs, Optiplan Kitchens’ Interior Designer. You can choose a common hue (such as grey used below) to tie the look together, or for maximum impact go for contrasting colours and styles. We are used to having a wide range of tech in our living spaces and as the lines continue to blue between kitchen and living room, we will see more uptake of smart home gear in the kitchen too. And it makes so much sense. Smart assistants were surely made for the times you have hands covered in dough and need to shout Alexa to ask how much flour your recipe needs – just make sure you place your Amazon Echo in ‘earshot’. Don’t forget to improve your kitchen with other available tech. Bluetooth speakers to blare your favourite tunes while you cook and automated lighting will enhance how you use the space even further. Book a free design consultation with Optiplan Kitchens and take the stress out of planning your new kitchen. All of Optiplan Kitchens’ collections are handmade in the UK and they offer full project management from start to finish, so it could not be easier to create a bespoke kitchen for your home. To see more of Optiplan Kitchens’ stunning ranges visit a showroom near you, or download their latest brochure.